Because survival after liver transplantation is influenced by age, weight, and nutritional status, many medical centers require a minimum weight for transplantation, ranging from 10 kg to as much as 20 kg at some centers. Duke’s pediatric liver transplant program has no minimum weight requirement and performs transplantation in babies as small as 2.5 kg. The program’s one- and three-year patient survival rates exceed the national average. 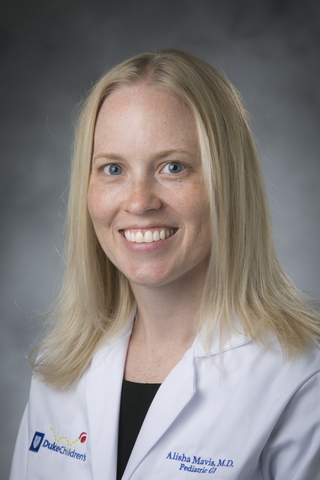 Alisha Mavis, MD, a Duke pediatric hepatologist and liver transplant specialist, discusses the critical factors that contribute to successful outcomes and shares how Duke cares for this high-risk patient population. What are some of the common conditions that lead to liver problems in babies? Mavis: We see patients with all types of liver disease but biliary atresia is the most common cause of chronic liver disease in babies. We also see infants with Alagille syndrome, an autosomal dominant genetic disorder that affects the liver; total parenteral nutrition-associated cholestasis that results from intravenous nutrition; short bowel syndrome, a malabsorption disorder caused by the lack of a functional small intestine; metabolic diseases; and acute liver failure of unknown etiology. Why are babies weighing less than 10 kg considered high risk for liver transplant? Mavis: First, the blood vessels in babies this small are only 1 to 2 mm in size, so the operation is technically very difficult and there’s a much higher risk for surgical complications. The training and expertise of our multidisciplinary team of hepatologists, surgeons, nurse practitioners, nephrologists, anesthesiologists, and nurses are vital for positive patient outcomes. Postoperatively, it’s important that patients are well cared for in a pediatric intensive care unit by staff who are experienced in caring specifically for these patients. Also, understanding which micro and macronutrients the babies need and making sure they’re receiving them is very important. We have a pediatric liver transplant dietitian to carefully monitor their unique nutritional needs. With the shortage of organs and long waiting lists for donors, are there any alternatives for obtaining suitable organs? Mavis: Yes. In the past, only livers from small children were deemed a suitable match for transplant in an infant; however, at Duke we can perform “cut-downs" or "split" grafts, in which a whole liver is cut down to the right size or a piece of a deceased adult liver is used for transplantation in a child. We can even divide a liver for transplantation into two different recipients. These techniques have reduced the time children spend on the waiting list. Does Duke accept livers from living donors for small infants? Mavis: Yes. In fact, many parents come to Duke specifically because they want the option of a living donor for their child. When there’s a suitable living donor, it allows us to schedule surgery with more control rather than having an unknown waiting list time, which is especially anxiety-provoking for the parents. How do you help ensure the patient receives the proper care at home to prevent complications postoperatively? Mavis: Chronic diseases place a significant burden on the child as well as the family. These children take lots of medications, they usually have many appointments with other specialists, and families often need to travel long distances for care. It’s very difficult for parents to manage these requirements, especially if they have other children at home, so we ensure that the child’s treatment plan is workable and integrated into family life. We can offer parents many resources, including social workers, transplant coordinators, and access to temporary housing to help ease the burden. When should pediatricians consider referring a child to the Duke program? Mavis: We encourage pediatricians to refer any child with chronic elevated liver enzymes or any concern for liver disease. The earlier we can intervene, the better the child’s outcome will be. And, we’re always happy to partner with community pediatricians so they can stay informed and involved in their patients’ care. Why Refer Infants to Duke’s Pediatric Liver Transplant Program? It is the only program in North and South Carolina that accepts critically ill, low-weight babies. One- and three-year pediatric patient survival rates after liver transplantation exceed the national average. The program offers all types of liver transplants, including whole, split, and reduced-size livers, all performed by highly trained transplant surgeons. Children benefit from the latest advances in transplant medicine based on research and data from liver transplant experts around the country who work with Duke hepatologists as part of the Studies for Pediatric Liver Transplantation Network.